As promised, we took the kids skating on Friday night. 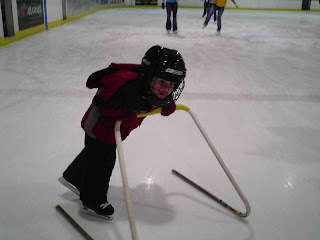 Overall, the kids made it through intact, and Older Son was enthusiastic about the promise of being able to skate like some of the better skaters on the ice. I think, however, he expected to be able to handle it right off the bat, but was quickly disavowed of that notion when he stepped onto the ice. Sunday's outing was perhaps just what we needed. He and I went by ourselves to an open skate at the same arena, and this time he fared much better, at one time ditching the skating trainer and skate-walking 10 ft to my so very proud arms. I'm hoping that at some point we can get out on a lake or pond, but that would add some challenging elements to the mix that he may not be ready for. Friday's adventure was without camera, since The Lovely Wife and I had one kid each (and Younger Son was beyond clingy, even though he was perfectly mobile on his bob skates). Today's outing allowed me just enough time to capture an action shot on the cell phone camera. Seriously, are you as proud as I am of this kid? Wait. You can get trainers? Why did nobody ever give me a trainer?